Terry Bergen, executive Director of the Outagamie Country Historical Society, has announced in the latest issue of Mystifier that, due to budget cuts, they are not able to renew their lease on the Sidney Radner collection. The collection will therefore be leaving Appleton in 2004 and a new exhibition, A.K.A. Houdini, will open in June. Bergen says the new exhibit will be double the size of their current Houdini exhibition. Unfortunately, the Mystifier newsletter will also be discontinued. But there will be a new Members Only section on the museum's official website. 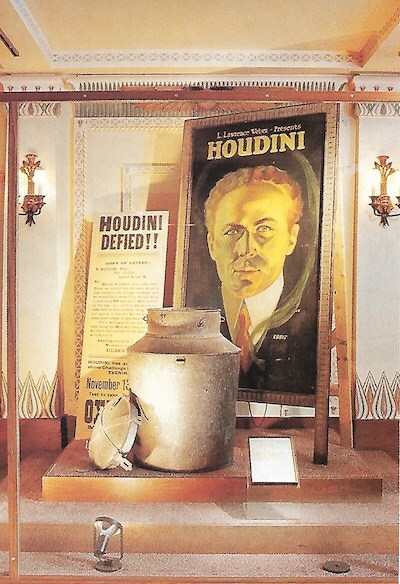 It's not clear what will happen to the Radner collection, which contains many showcase treasures, such as Houdini's original Milk Can (pictured). The Houdini Historical Center has held the collection for 15 years.